Figure 4-2. - Loop, or ring, distribution system. A fault in the primary loop is cleared by the breakers in the loop nearest the fault, and power is supplied the other way around the loop without interruption to most of the connected loads. Because the load points can be supplied from two or more directions, it is possible to remove any section of the loop from service for maintenance without causing an outage at other load points. If a fault occurs in a section adjacent to the distribution substation, the entire load may have to be fed from one side of the loop until repairs are made. Sufficient conductor capacity must be provided in the loop to permit operation without excessive voltage drop or overheating of the feeder when either side of the loop is out of service. 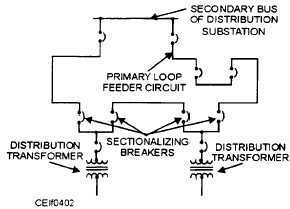 If a fault occurs in the distribution transformer, it is cleared by the breaker in the primary leads; and the loop remains intact. The network and radial systems differ with respect to the transformer secondaries. In a network system (fig. 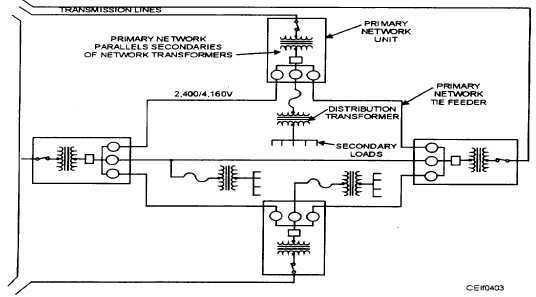 4-3) transformer secondaries are paralleled; in a radial system, they are not. The network is the most flexible type of primary system; it provides the best service reliability to the distribution transformers or load center, particularly when the system is supplied from two or more distribution substations. Power can flow from any substation to any distribution transformer or load center in the network system. The network system is more flexible with regard to load growth than the radial or loop system and is adaptable to any rate of load growth. Service readily can be extended to additional points of usage with relatively small amounts of new construction. The network system, however, requires large quantities of equipment and extensive relaying; therefore, it is more expensive than the radial system. From the standpoint of economy, the network system is suitable only in heavy-load-density areas where the load center units range from 1,000 to 4,000 kilovoltamperes (kVA). Figure 4-3. - Network distribution system.